Being the compiler of the DXpedition chronicles has its perks - I can decide to lead off if I want! This year's DXpedition was another success. While we missed Mark Clark, who attended last year, but was forced to bow out shortly beforehand due to work commitments, I was able to recruit Michael Temme-Soifer of Egg Harbor City, NJ, who is an active FM & TV DX’er with WTFDA and also dabbles in AM to join us Saturday evening. He jumped right in using Bruce’s Sony ICF-2010 and seemed quite impressed with some of the Trans-atlantic (TA) catches. This year I finally had my own 2010, a rebuilt and modified one which performed quite well, hearing anything the other 2010 did and most of what the Drakes heard. It’s a little tougher on some of the tighter splits, but I’d also not had much opportunity to play with it on those prior to LBI-4. It has passband tuning added, which I want to work with as well. Rollout of the Southern BOG, which fell to Rob Stonier and I, was much more uneventful than the others had with the Northern one, as can be seen from their accounts following. This time, I’m returning home tempted to make some added efforts to snag some TA’s from home. One of those will be to raise the loop up closer to the floor of the first floor above in the hopes of reducing the horizon blockage resulting from a basement location for my shack. Failing that, it may be time to take the 2010 upstairs, even though it is a bit rough-looking and I’m sure won’t impress my aesthetics-conscious wife. As I’ve said after each one of the 3 prior LBI’s, even absent good conditions, the camaraderie, good pizza, good beer and lots of time to talk DX is plenty of incentive all by itself to keep coming back! In some ways, this year’s LBI DXpedition was similar to last year: many of the same European stations were logged, a smattering of Caribbean and northern South American stations were heard, and some new Canadian Maritimes were picked up. What was different was the weaker reception of stations that literally boomed in last year (Norway, Virgin Radio and Croatia), a stronger Spain on 684 kHz that lasted throughout the night, and the reception of Middle Eastern outlets like Farda and Sawa that had eluded us earlier years. The daily “window” of TA DX seemed smaller this year, but good conditions to the south meant there was still plenty to hear. The propagation conditions (A-24 and K-4 the first night) likely had a great impact on these results. While we sweated the solar forecast during the weeks leading up to LBI-4, in spite of those numbers I would still say it was a successful event. Every year we try to “kick it up” a notch, and this year was no exception. 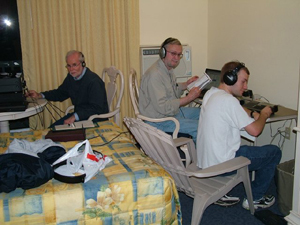 Thanks to Bill’s wireless router and the hotel’s new Internet connection, we were able to participate live from LBI in the IRC medium wave chat room #MWDX with other DXers in the US, Canada and Europe. That, plus streaming webcam pictures from the site, gave new meaning to the term “virtual DXpedition” (see www.radiodxing.com/webcam.html for the archive). The addition of Dave’s DX Engineering RPA-1 amplifier to Bruce’s 6-foot [Mark Connelly-designed] broadband loop was a real treat – I can see real potential in phasing two of these loops, which is one of my goals for next year. Good conversation, good DX and 70-degree temperatures combined to make this a memorable weekend. I look forward to next year’s LBI DXpedition! 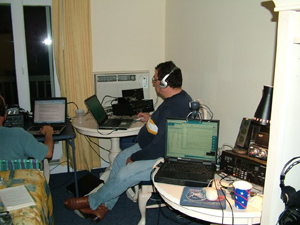 Our fourth DXpedition to the Jersey shore was successful, with respect to both participation and loggings. We had 7 DXers on Friday night, joined by Michael on Saturday. I arrived around 2 PM on Friday, a bit too late to help deploy the BOGs, but not too late to run to the town hall with Bob. It turns out that one of Ship Bottom's Finest saw us laying out the northern BOG wire, and asked us if we had a permit. Of course we didn't, so he told us to go to the town hall and talk to someone. Bob and I, being of course the best looking and most responsible members of our rogues' gallery, volunteered to go. We met with the town administrator for about ten minutes and explained what we were up to. He was concerned about legal issues; for instance, if someone sued the town for tripping over our wires. We tactfully declined to remind him that there was lots of old fencing with rusty nails sticking up right where our wires ran along the fence by the dunes. So we convinced him that we were aware of his concerns and would ensure that the wires did not get in the way of anyone walking around by the rusty nails. Bob and I went out and re-buried the north wire at the pedestrian and vehicle entrances to the beach. We got to the dials later than we hoped for because of this incident and because it always takes longer to set up than you think, particularly with four antennas and eight radios. Friday evening was a good mix of low-band, low-latitude TAs and some LAs. On Friday or Saturday we didn't hear much from the northerly TAs like Virgin on 1215, Norway on 1314 or Croatia on 1134. On Saturday afternoon Bruce and I went to the north end of the island to Barnegat Lighthouse and climbed up to the top. Bruce fantasized about dropping a 175 foot vertical wire from the top and using that next year- we'll see… We got back in time to hit the dials right before 4 PM, and I was blown away with the DX that rolled in with the sun still shining: Saudi on 1521, R. Sawa from Djibouti, R. Farda from UAE, and Albania were the highlights. The band was open for TAs for a few hours after dark and then tapered off, but it opened up to the south later in the evening. The highlight after midnight was excellent copy of a soccer game in Spanish on 1140 with Morelia vs. someone else. We ID’ed it tentatively as the 1000-watter from Morelia, Mexico on 1140. Viva Monarcos! On Saturday we also deployed a sloper from a third floor room down to the beach. We aimed it at Brazil and Africa, and we found it was highly directional - to the west ! I had excellent copy on WOSU, Columbus, Ohio. We fed the sloper from the high (motel) western end, to save on coax runs, but maybe if we feed it from the eastern (beach) end next year it will be more directional in the direction we actually want. Maybe the antenna gurus out there can enlighten us. Good DX, good friends, beer, pizza, spring-like weather: all in all an excellent weekend! - Stations on the “most wanted” list finally heard: R. Sawa 1431 and 1548, Grenada on 535, Algeria 252. 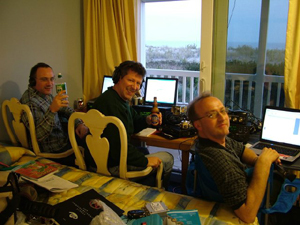 This was the 4th LBI Dxpedition, and my 3rd. Last year, we had fabulous conditions 28 days out; this year, it was much iffier (if that’s a word?) Solar prediction was for a “slight possibility of an event,” not what you want. Fortunately, all was well, and in fact we had a 90 minute sunset session on Saturday that was, as Mark Connelly would say, “a salad bar of signals” - hets on EVERY channel and multiples on many, with fabulous audio on some new ones, including Portugal 1035 and Iran 1503! As in 2004, we dodged a bullet this year as a solar flare did occur the day after we left and shut TA’s down completely for a day or two. Stations farther north were not good—Norway 1314 was 30 over S9 last year and barely listenable this year. But lower latitudes were better than last year, giving us Middle Eastern stations we could only log as “tentative” last year. Conditions faded around 9pm both nights, leaving just the “normal” stuff at listenable levels. It gave us a chance to scout around a bit—Dave went to 60 meters, then several of us chased the presumed 1kw 1140 from Mexico Saturday night, and I did a little tropical band and beacon chasing. I didn’t know it at the time, but Jean Burnell and friends were doing a parallel Newfie DXpedition the same weekend, and by their early reports it seems they had more auroral conditions than us, likely because of their much higher latitude. Mark Connelly also ran a parallel effort from Massachusetts and reported similar catches to ours. Because of work issues, I wasn’t sure I’d make it until about 2-3 weeks before the weekend, so I volunteered to sleep in radio room #1, rather than possibly get stuck paying a deposit on a room if I had to cancel. I’ve always been nervous about letting $10,000-$15,000 worth of stuff in there overnight anyway. Bill Harms wanted to try for TP signals at local sunrise - he’s been getting snatches of something on 738 after local sunrise at his home in Maryland. I said “no problem—I’ll get plenty of sleep when I’m dead”. Of course, I went to bed at 2:30am and at 5:30 there was Bill knocking on the door. I thought “I’ll be a @#$%^*, he WAS serious,” and got up and tuned around with him for a few minutes before hitting the sack again. He saw carriers on his PC spectral display on 738, but no audio to speak of. Seems LBI wouldn’t be complete without a little drama; LBI-2 featured the mains power in the entire motel browning out to 91 volts the 1st night. This year, Bob and I were 5 minutes away from completing the northern Eurobog (all 1000 feet of it). As Dave mentioned earlier, we had just finished burying it deep under the vehicle entry path to the beach, when up pulled Officer Not-So-Friendly wanting to know what we were doing, and did we have a permit? Um, nope. Didn’t the last 3 years either. He told us to go to city hall and talk to someone, and that we’d likely be told to roll up the wire. The thought of no BOGS and having to go with just the broadband loops was NOT appealing - I could see our weekend getting ugly quickly! So we dispatched Dave and Bob to city hall - mainly because they were voted MLTGE (Most Likely To Grovel Effectively) and they got our clearance! I’ll say this: Ham Radio helped - the local hams are active and helpful on the island, apparently, because the city guy likened our activities to hams and mentioned the good relationship they had with the city personnel there. Thank you, LBI hams!! Next year, we’ll call in advance in get a permit! All in all, a good weekend with good conditions, good friends, mostly good food (NO one on LBI can make pizza-it’s worth the drive to Manahawkin to Pizza Hut!). Thanks to Russ for compiling and editing the logs and musings-looking forward to LBI-5 in 2006! LBI-4 was great experience. It was fun renewing friendships with other DXers. We had some interesting and spirited discussions about DX club politics as well. Conditions overall were fair and seemed to favor the lower latitude station. There were a couple of good opening for an hour or two at a time. At sunset on 11/6 stations were coming in fast and strong. I was hoping that we could get some loggings of lower powered stations on the regional channels, but alas, the opening did not stay up all evening. Of interest were loggings from Egypt (I think) and of VOA Sao Tome. The Maritime Province stations were booming in through much of the time, with CHCM on 740 blowing away CHWO for example. I am already looking forward to next year. LBI-4 could be titled, "raising the bar of camaraderie." We seemingly hit the ground running, from the better organization heading into the weekend, to the setup of the beverages and consumption of beverages, along with the level of humor. 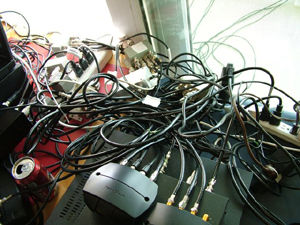 More than eight radios were wired in two rooms in The Drifting Sands Motel using the setup skills of the group. The quality of these skills is illustrated in another LBI-4 photo - that of the pile of wires behind the radios. This picture quickly became the wallpaper on many of our PC notebooks. This gave me the thought of how our equipment has evolved through just four years at LBI. A potpourri of radios and no computers has progressed to almost everyone using one of the Drake R8 series of radios, phasers and using a wifi net for DX tips. It also led to a DX distraction, as I checked my personal email, downloaded a provocative picture, and shared it periodically with Bruce and Dave, who were sitting on either side of me. The big disappointment of last year, no middle east other than Saudi Arabia - 1521, was quickly conquered early on Saturday. Radio Farda 1575 was at armchair level at 4:32pm local. Also received, though weaker, were the Sawa stations of Djibouti 1431 and Kuwait 1548. Many Europeans were received, including new ones not picked up last year. But the Euro conditions of LBI-3, when we had hours-long s9+35 signals from NRK and Virgin Radio, were not duplicated. Every DXpedition has its disappointment, and this one was no different. While listening to the same "futbol" game on numerous channels, we thought it was from the XEX network of station in Mexico. This initial belief was reinforced by Dave having excellent reception of a weak powered Mexican broadcasting a different game. However, a check of the WRTH showed a Cuban station on each of those frequencies. We later concluded the game was, indeed, coming from Cuba. Shouts of &*#%$$#@*! Fidel permeated the room. While at the Sunday morning breakfast, we commented on how this was the best attended DXpedition in years. And, even with the friendships we have, we were happy to have new and young blood in Michael, who heard about our DXpedition, lived about a half hour away and joined us Saturday night. 162 FRANCE France-Inter, Allouis NOV 4 0059 - Talk by man in French, time pips at top of hour, into news read by woman. 171 MOROCCO R.Mediterranee Internationale, Nador NOV 5 0136 - Arabic music. 183 GERMANY Europe No. 1, Felsberg NOV 4 2310 - Talk by several people in the studio in French, music, very nice signal. 198 ALGERIA Chaîne 1, Ouargla NOV 4 0002 - Talk by man and woman. 198 UNITED KINGDOM BBC R.4, Droitwich et al. NOV 4 2344 - Fair with English talk; rough copy. 216 FRANCE RMC Roumoules NOV 4 - Fair; weak with French talk. 234 LUXEMBOURG R.Luxembourg, Junglinster NOV 4 0013 - Fair; pop music. 252 ALGERIA R.Alger Int’l, Tipaza NOV 4 0013 - Nice jazz music, pop music (Tracy Chapman), talk by two men in French. 252 IRELAND RTÉ R.1, Clarkestown NOV 5 0138 - Jazz vocal music, parallel 567 and webstream. 531 ALGERIA Chaîne 1, Ain-el-Beida NOV 5 2208 - French talk; clearly not Spanish. 549 ALGERIA Alger Chaîne 1, Les Trembles NOV 5 2210 - French talk parallel 891 kHz. 558 SPAIN RNE5 synchros NOV 4 0018 - Talk by man and woman in Spanish, parallel 684, 738 and 855 kHz. 567 IRELAND RTÉ Tullamore NOV 6 0200 - Good with female announcer reading news. 567 SPAIN RNE5 synchros NOV 5 0100 - Fair; Spanish talk. 576 CANARY ISLANDS // SPAIN RNE5 synchros NOV 5 2245 - Soft female vocal. 585 SPAIN RNE1 Madrid NOV 4 0200 - Talk by man in Spanish, time pips at the top of hour, ID, very strong signal. 594 BULGARIA R.Horizont, Pleven NOV 4 0201 - Two carriers on frequency, talk by man, language definitely not Arabic (so not Morocco) - had a Slavic sound, so who? Bulgaria? 594 MOROCCO RTM Oujda NOV 5 2148 - Pop music with Arabic lyrics. 594 PORTUGAL R.Renascença, Muge NOV 4 2240 - Rapid-fire talk by man in Portuguese, sounds like a sports event (futebol?). 603 FRANCE France Info, Lyon NOV 5 0220 - Good; parallel 1377 kHz. 603 SPAIN RNE5 synchros NOV 4 2242 - Talk by woman in Spanish. 612 MOROCCO RTM A, Sebaâ-Aioun NOV 4 2246 - Talk by man in either French or Arabic, then talk by woman. 621 CANARY ISLANDS // SPAIN RNE1 synchros, Santa Cruz de Tenerife et al. NOV 4 0108 - Talk by man in Spanish, very strong signal, parallel 639 kHz. 675 NETHERLANDS Arrow Rock Radio, Lopik NOV 5 2305 - Rock music, fair strength. 684 SPAIN RNE1 Sevilla NOV 4 2250 - Music, strongest TA signal of the night, parallel 693, 738 (also very strong), 855 (weaker). 693 SPAIN RNE1 synchros NOV 4 2328 - Man talking parallel 684 and 855 kHz. 693 UNITED KINGDOM BBC R. 5 Live, Droitwich et al. NOV 5 2152 - Very loud, S-9 armchair copy. 711 FRANCE France Info, Rennes NOV 5 0615 - Talk, parallel 945 kHz. 729 SPAIN RNE1 synchros NOV 4 0208 - Parallel 684, 738 kHz. 729 unID NOV 5 0500 - Discussion by two men in French, competing with Spain. 738 SPAIN RNE1 Barcelona NOV 4 2332 - Parallel other RNE1. 747 NETHERLANDS 747AM Flevoland NOV 5 2147 - Pop music. 747 CANARY ISLANDS // SPAIN RNE5 synchros NOV 5 2313 - Talk in Spanish and ID parallel 684 kHz. 765 SWITZERLAND RSR Option Musique, Sottens NOV 5 0224 - Good; pop music. 774 EGYPT Middle East Radio, Abis NOV 5 0108 - Arabic music. 774 SPAIN RNE1 synchros NOV 5 0230 - Music, talk by man. 783 MAURITANIA R.Mauritanie, Nouakchott NOV 4 2251 - Music with African drums - huge signal, 15 over S-9. 792 FRANCE France Info, Limoges NOV 5 0600 - Talk by woman in French. 792 SPAIN SER Sevilla NOV 5 2301 - Male announcer in Spanish. 819 EGYPT ERTU Batra NOV 4 2255 - Talk by woman in Arabic parallel 12050 kHz. 837 FRANCE France Info, Nancy NOV 5 2315 - Talk by man in French. 855 SPAIN RNE1 synchros NOV 4 2329 - Man talking parallel 684 and 693 kHz. 855 unID NOV 5 0247 - Female vocal under Spain. 864 FRANCE France Bleu, Villebon-sur-Yvette NOV 4 2330 - Excellent; armchair copy. 891 ALGERIA Chaîne 1, Algiers NOV 5 2209 - French talk parallel 549 kHz. 909 UNITED KINGDOM BBC R.5 Live synchros NOV 4 2246 - BBC program with talk by man in English, ID , parallel 693 kHz. 945 FRANCE France Info, Toulouse NOV 4 2250 - Excellent with male French talk. 954 SPAIN Onda Cero, Madrid NOV 5 0000 - Good; Spanish talk. 963 PORTUGAL R.Renascença, Seixal NOV 6 0020 - Talk parallel 594 kHz. 999 SPAIN COPE Madrid NOV 5 2146 - Talk parallel 558 kHz. 1035 PORTUGAL R.Clube Português, Belmonte NOV 5 2338 - Hues Corp. “Rock the Boat,” Laura Branigan “Self Control,” male announcer, armchair copy, confirmed via webstream. 1044 MOROCCO RTM A, Sebaâ-Aioun NOV 5 0338 - Strong and sounded French. 1053 SPAIN COPE synchros NOV 5 2200 - Strong, +10; man talking in Spanish. 1116 unID NOV 5 0012 - Spanish or Italian. 1134 CROATIA Glas Hrvatske, Zadar NOV 6 0145 - Fair with lots of WBBR slop and weak signal strength. 1206 FRANCE France Info, Bordeaux NOV 4 2245 - Talk by two men in studio in French. 1215 SPAIN COPE synchros NOV 5 0150 - Spanish way under Virgin; poor to fair. 1215 UNITED KINGDOM Virgin R. synchros NOV 4 2325 - Man talking in accented English. Near armchair copy later at 0146. 1341 NORTHERN IRELAND BBC R.Ulster, Lisnagarvey NOV 5 0025 - Presumed the one trying to break through WMID slop. 1377 FRANCE France Info, Lille NOV 5 0014 - Good; French talk parallel 603 kHz. 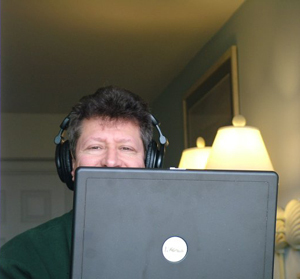 1394.8 ALBANIA TWR Fllakë NOV 5 2110 - Brief audio, Mark Connelly logged earlier in the day in Massachusetts. 1422 GERMANY Deutschlandfunk, Heusweiler NOV 5 0032 - Presumed the one with audio at threshold here. 1431 DJIBOUTI R.Sawa, Arta NOV 5 2115 - Parallel website audio with talk by woman, Middle Eastern pop music. 1467 FRANCE TWR Roumoules NOV 5 2140 - Very large signal. 1503 IRAN IRIB Sarasary, Bushehr NOV 5 2141 - Tentative last year, loud this year - male announcer, wailing male vocal. 1512 unID NOV 5 2126 - Very strong but didn’t stick for ID; not parallel 1521 kHz. 1521 SAUDI ARABIA BSKSA Duba NOV 5 2103 - Good to very good with Arab male talk. 1530 SAO TOME E PRINCIPE VOA Pinheira NOV 5 0115 - Parallel 7115 kHz. WCKY phased and mixing with a Latin. 1548 KUWAIT R.Sawa, Kabd-Kuwait City NOV 5 2120 - “Sawa” in male voice with reverb effect, music with beat. 1575 UNITED ARAB EMIRATES R.Farda, Al Dhabiya NOV 4 0044 - Strong at peaks; +10; Middle Eastern-flavored rock music, parallel 9585 and web stream, heard both days. 1584 CEUTA RadiOlé, Ceuta NOV 6 0514 - Salsa music. Something else under, not ID’ed. 1602 SPAIN SER synchros NOV 5 0101 - Spanish talk. 198 UNITED STATES DAW Dixon NC NOV 5 0008 - Non-directional beacon (NDB). 216 UNITED STATES CLB Carolina Beach NC NOV 5 0010 - NDB. 248 JAMAICA MBJ Montego Bay NOV 6 0636 - NDB. 272 CANADA YQA Muskoka ON NOV 5 0502 - NDB. 273 CANADA ZV Sept Ils QC NOV 5 0502 - NDB. 276 CANADA YHR Chevery QC NOV 5 0504 - NDB. 278 CANADA NM Matagami QC NOV 6 0642 - NDB. 289 CANADA YLQ La Tuque QC NOV 6 0644 - NDB. 303 CANADA YPP Parent QC NOV 6 0648 - NDB. 326 CANADA FC Fredericton NB NOV 6 0650 - NDB. 344 CAYMAN ISLANDS ZIY Grand Cayman NOV 6 0653 - NDB. 347 CANADA YG Charlottetown PE NOV 6 0655 - NDB. 350 UNITED STATES LE Raleigh NC NOV 6 0657 - NDB. 535 GRENADA GBC St. George’s NOV 6 0657 - Talk by two men in English, time pips at top of hour, poor but readable. 540 CANADA CBT Grand Falls NL NOV 5 2312 - CBC program in English. 540 UNITED STATES WFLA Orlando FL NOV 5 2300 - Excellent on south wire; S9+30 over; top of hour ID. 555 ST. KITTS & NEVIS ZIZ Basseterre NOV 4 2221 - Fair quality with reggae music. 560 unID NOV 5 0303 - Spanish ballads, male, female solos under WFIL, WVOC. 580 DOMINICAN REPUBLIC HIAX R.Montecristi, Montecristi NOV 4 0300 - ID, sign off announcements, then into Dom Rep national anthem; 3000 watts. 590 unID NOV 5 0310 - Soft instrumentals with brief male, female announcements in Spanish. 620 CUBA CMGN R.Rebelde, Colón NOV 4 0251 - Parallel 560, 600, 610, and 5025 with Spanish talk. 630 CUBA R.Progreso, Pinar del Río NOV 6 0545 - Excited fútbol play by play, parallel 640 (with possible “network” echo), 680, 690, 730 and 900 kHz. Thought is was more exotic than Cuba until we heard all the parallels! 650 COLOMBIA HJKH RCN Antena Dos, Bogotá NOV 4 0248 - Upbeat Latin music, mention of Colombian banks, well over WSM on southern BOG both evenings. 670 CUBA R.Rebelde, Arroyo Arenas NOV 5 2250 - Speech parallel several others. 680 CUBA R.Progreso, multiple sites NOV 6 0630 - Lots of parallels. 690 CUBA R.Progreso, Jovellanos NOV 6 0630 - Lots of parallels. 700 unID NOV 5 0230 - “Flashdance” under WLW Cincinnati. 710 CUBA R.Rebelde, multiple sites NOV 5 2253 - Speech parallel several others. 710 unID NOV 5 0450 - Spanish talk over WOR. 720 JAMAICA RJR Innswood, St. Catherine NOV 4 0336 - Caribbean music, talk in accented English by man, lots of IDs at top of hour. 740 CANADA CHCM Marystown NL NOV 5 0300 - Classic C&W music, ID, “590, VOCM Radio Network” and “VOCM CFCR Radio Service.” Comparing antennas, CHCM was dominant on north BOG, CHWO was on the east-west sloper, and an unID Latin American (Cuba?) was on the south BOG. 760 COLOMBIA HJAJ RCN Barranquilla NOV 5 0132 - Talk by man in Spanish, ID, commercials, parallel 770 kHz. NOV 5 0326 - RCN ID. 760 CUBA unID NOV 5 0335 - Soft music parallel 770, 780 kHz. 770 COLOMBIA HJJX RCN Bogotá NOV 4 0132 - Talk by man in Spanish, parallel 760 kHz. 770 CUBA unID NOV 5 0336 - Soft music parallel 760, 780 kHz. 780 CANADA CFDR Classic Country 780 Kicks, Dartmouth NS NOV 5 2234 - Ads for Nashville, Christmas Expo in Halifax, Remembrance Day. 780 CUBA unID NOV 5 0337 - Soft music parallel 760, 770 kHz. 780 VENEZUELA YVMN R.Coro, Coro NOV 4 0240 - Several IDs in Spanish. 810 COLOMBIA HJCY CARACOL Bogotá NOV 4 0239 - Talk by man in Spanish, mentions of Colombia. 820 ST. KITTS & NEVIS TBN / R.Paradise, Charlestown NOV 6 0702 - Screechy female preacher, confirmed via shortwave parallel. 820 UNITED STATES WOSU Columbus OH NOV 5 2333 - Bluegrass show, matches website stream; on “southeast” sloper. 890 CUBA unID NOV 5 0348 - “Radio Cadena Nacional” ID. 895 ST. KITTS & NEVIS VON Bath Village NOV 4 2220 - Talk by man in English, poor signal. 900 CUBA CMKP R.Progreso, Cacocum NOV 6 0630 - Lots of parallels. 1140 MEXICO XELIA Morelia NOV 6 0535 - Presumed; lots of Morelia mentions; web search showed them playing that night. XEMR is also possible; others logged fútbol coverage on XEX, XEFB, and XEW. 1260 CANADA CKHJ Fredericton NB NOV 5 0330 - C&W music, ID, “Today’s country, KHJ,” poppy day ad, weather forecast. 1290 CANADA CJBK London ON NOV 5 0345 - ID, “1290 CJBK,” Paul Harvey ad. 1540 BAHAMAS ZNS1 Nassau NOV 5 2250 - Clear ID. 1610 UNITED STATES WVIR Visitor Information Radio, Atlantic City NOV 5 1400 - TIS, “Welcome to the Atlantic City Visitor Information Radio, WVIR,” with loop of information on visiting Atlantic City. 1620 UNITED STATES Ocean City NJ NOV 5 1744 - Emergency Advisory Radio Station with announcements for hurricane preparation. 1630.042 UNITED STATES Atlantic City NJ NOV 5 1745 - NOAA weather loop, presumed from Atlantic City.